The United States Mint first issued the American Eagle coinage in 1986 with a silver and gold coin available to investors and collectors. The bullion and proof versions of American Eagle coins feature different designs for each metal, expanding in 1997 to include a Platinum Eagle and more recently in 2017 to include the new Palladium Eagle. The 2018-W 1 oz Proof Palladium American Eagle Coin is currently available to you for purchase online at Silver.com in perfect condition. Coin ships to you inside of a protective plastic slab courtesy of the NGC! First year of issue for the Proof Palladium Eagle! Availability of certified coins is limited within the original mintage of 15,000 coins! The obverse includes a left-profile portrait of Liberty. Reverse depicts the American bald eagle on a cliff’s edge. Proof coinage is almost always at its most popular point during its first year of availability. Outside of the first-ever issues, those released for anniversary dates such as 10th, 20th, and 30th anniversaries tend to attract the most interest. 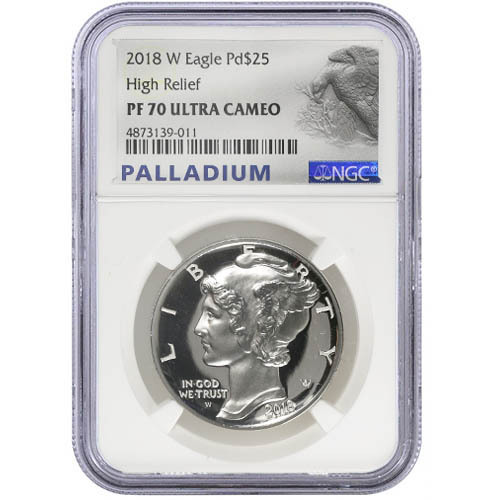 These 2018-W Proof Palladium American Eagle Coins are the first of their kind and are a must-have for any collector of American Eagle coins or American coinage in general. The Proof Palladium Eagle and its bullion counterpart have been a long time coming. Congress first offered approval to the Treasury and United States Mint to offer a palladium version of the American Eagle in 2010, but it would be another year before it came to fruition. 2017 saw the introduction of the bullion versions, and now 2018 brings the first-ever proof version. On the obverse of 2018-W 1 oz Proof Palladium American Eagle Coins is the left-profile portrait of Liberty designed by Adolph A. Weinman in 1916 for the US dime. The design was known as Winged Liberty, but often referred to ask the Mercury Dime because Liberty’s Phrygian cap reminded people of the Roman messenger god Mercury. The reverse of the 2018 Proof Palladium Eagle Coin includes another design from Weinman. This design of the American eagle on a rock cliff clutching a branch in its talons first appeared on the 1907 American Institute of Architects Gold Medal. 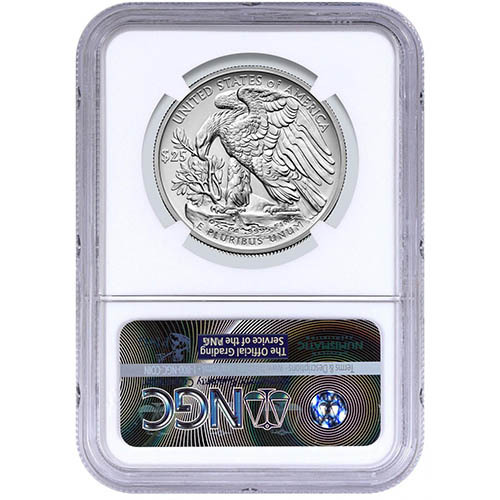 These 2018-W 1 oz Proof Palladium American Eagle Coins are perfect specimens according to the NGC. Coins with a PF70 certification have full, original mint luster and no detracting flaws of any kind. We encourage Silver.com customers to call us with questions at 888-989-7223. You can also connect with us live online using our chat service or email address.